Executive style and sound! Listen to CDs, AM/FM radio, and connect your smartphone or MP3 player to the Aux in. This compact design pumps out big sound perfect for any room. The GPX HC425B Stereo Home Music System looks great anywhere in your home. 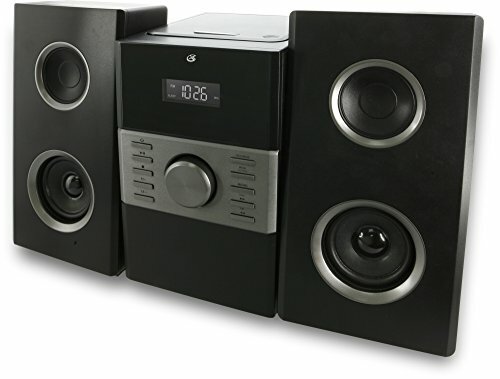 It features 2-channel stereo sound and a top-loading CD player that plays CD and CD-R/RW. The stereo speakers are detachable so you have more flexibility with placement on your desktop, shelf or counter area. Enjoy your favorite AM/FM radio station over the built-in antennas. Each system has 3.5mm audio input for plugging in your smartphone or personal MP3 player. A remote control is included with a pre-installed battery for greater convenience. A negative LCD display with white backlight and dimmer control make this a sharp unit to have in your home. This system also has a digital clock with single alarm and sleep timer and a built-in AC power cable. For more than 30 years, GPX has offered one of the broadest portfolios of technology-driven consumer audio and video products. An award-winning consumer electronics company, GPX has built a solid reputation on excellent product quality, reliability, design, and affordability. Built-in AC power cable. Please Note: Kindly refer the User Guide before use. If you have any questions about this product by GPX, contact us by completing and submitting the form below. If you are looking for a specif part number, please include it with your message.